Rise above that petty ego !!! In the movie “Love Story,” there is a line that says, “Love means never having to say that you’re sorry.” It is wrong, absolutely wrong. Love means- being the very first one to admit when you’re wrong and, also, always be the first one to apologize. If you are thinking of mending fences or wishing to apologize to the people you have (or may have) wronged, at the top of your list should be your spouse, your children, your friends and your relatives because we tend to take them for granted. It is because they love us more than we realise, that they are not so vocal or expressive about their hurt. Remember just as we take their love for granted, they too put up with our harsh words/ ill behaviour. Making amends will bring much needed peace as well as healing and strengthen your relationship as well. Don’t you think, today, this very moment is the right time to walk that extra mile, take that long overdue step and seek their forgiveness? It will, indeed, be so very sad if you realized towards the end of your life that there were people who you should have apologize to. 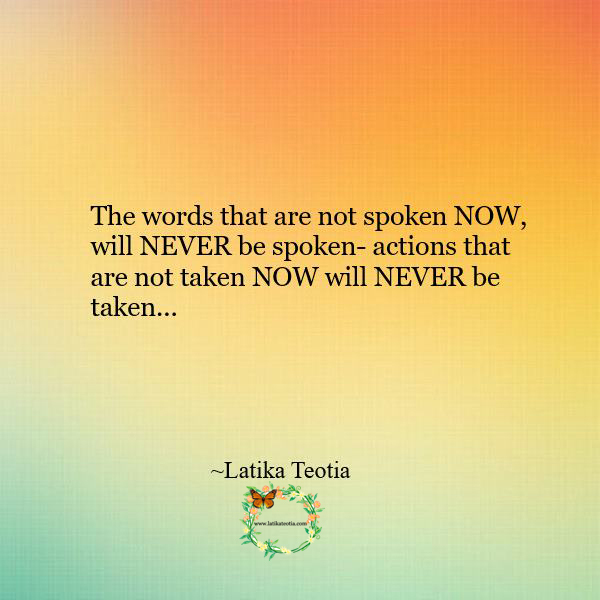 Remember the words that are not spoken NOW, will NEVER be spoken- actions that are not taken NOW will NEVER be taken. Previous PostPrevious Keep the “come what may” spirit alive !!! Next PostNext My prayer !! !